RALEIGH, N.C. — The Marine Corps held scheduled a news conference Friday morning to offer more details about what happened when a CH-53E Super Stallion helicopter had to land harder and faster than normal during training at Camp Lejeune, North Carolina, resulting in one death and 11 injuries. Col. Jeffrey Kenney identified the deceased Marine as Staff Sgt. Jonathan Lewis, 31, a native of Warrenton, Virginia. He said Lewis was inside the helicopter when he was killed. 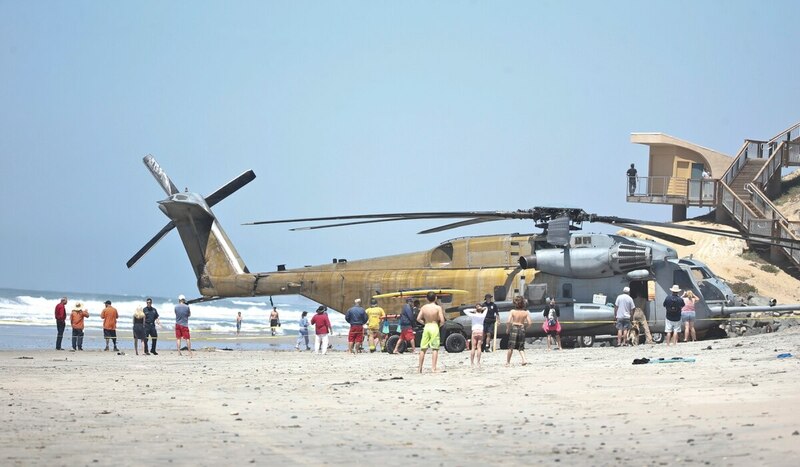 The CH-53E Super Stallion helicopter made the hard landing around 9 p.m. on Wednesday in a training area known as Stone Bay, military officials said. Lewis and the 11 comrades who sustained injuries were taking part in a helicopter ropes exercise that's described as "high-risk" in a training manual that underscores the dangers. About 20 Marines were participating in the training that requires them to exit through the back of the helicopter using suspended ropes, according to a news release. The technique allows Marines to enter and exit terrain where helicopter landings would be difficult. A 2003 edition of the Marines' manual for Helicopter Rope Suspension Techniques acknowledges the dangers, warning of the potential for injury or death. It also discusses how nighttime operations can be a challenge, lays out safety procedures and primes Marines on how wind from the helicopter's rotors can affect them. It's not clear if those factors played a role. The Marines have declined to say what may have caused the hard landing, or whether the Marines were in the aircraft, on ropes or on the ground. The Marines called the accident a hard landing, which generally describes when an aircraft hits the ground with greater speed and force than normal. The weather appeared to be calm at the time. Skies were clear, winds were less than 5 mph and the temperature was 79 degrees, according to the National Weather Service. One Marine was taken from the scene by medical aircraft and pronounced dead at the hospital, according to a news release. Two remained hospitalized in stable condition Thursday afternoon. Nine have been treated and released. No names have been disclosed. "The loss of a Marine or sailor affects us all. My heartfelt condolences go out to the families and friends of our deceased Marine," Maj. Gen. William Beydler, commanding general of II Marine Expeditionary Force, said. The helicopter was assigned to Heavy Helicopter Squadron-464, Marine Aircraft Group 29, 2nd Marine Aircraft Wing. The Super Stallion, a massive, heavy-lift helicopter, is the largest in the military and considered the Marine Corps' workhorse. It stands nearly three stories tall and has a top speed of 172 mph. The Marine Corps website says the aircraft can carry 16 tons of cargo — such as the Marines' Light Armored Vehicle — on a 100-mile roundtrip and says it has "the armament, speed and agility to qualify as much more than a heavy lifter." It was used in Afghanistan and Iraq to ferry troops and equipment to remote bases. In 2005, a CH-53E went down in bad weather in western Iraq, killing 30 Marines and a sailor. At the time, it was the worst loss of life for the Marines since the 1983 bombing of a Marine barracks in Beirut, Lebanon, that killed 220 Marines. Military officials said in 2005 that the model's safety record was on par with other Marine Corps aircraft. In April, a Marine Corps CH-53E had to make an emergency landing on a California beach after a low oil-pressure indicator light went on in the cockpit during training. It didn't cause any damage or injuries. In March, a Black Hawk crashed in a thick fog during training off Florida, killing 11 service members. The military said two National Guard pilots became disoriented while switching from visual-based to instrument-based flight procedures.